The headline-grabbing policies of General Election hopefuls are the subject of these political posters. When Theresa May announced the UK snap election back in April, plenty of people sighed with resignation. Surely the Tories would secure a landslide victory? But with a campaign filled with U-turns and questionable policies, perhaps the outcome isn't so easy to predict. 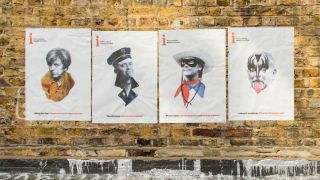 As part of its coverage of the 2017 election, the i newspaper has teamed up with Atomic London to create a series of posters that turns these party policies into provocative posters. We've already seen how graphic designers have used their creativity to urge young people to rise up and vote, but perhaps these posters will help floating voters to decide who to support. Appearing over various media platforms in the build up to election day on 8 June and beyond, these posters highlight the topics which have become synonymous with party leaders throughout the campaigning process. Click through the images in the gallery below to see the leaders of the biggest political parties turned into satirical caricatures. Can Lone Ranger Nicola Sturgeon secure independence for Scotland?